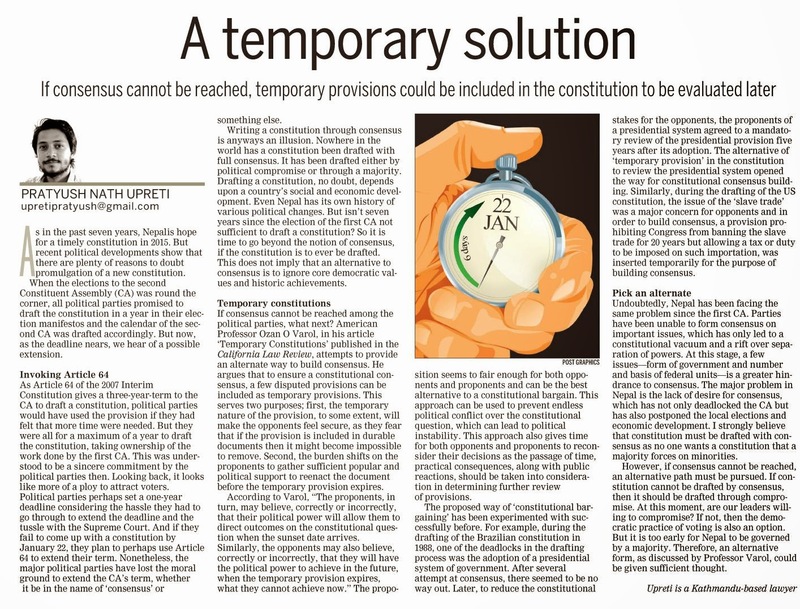 As Article 64 of the 2007 Interim Constitution gives a three-year-term to the CA to draft a constitution , political parties would have used the provision if they had felt that more time were needed. But they were all for a maximum of a year to draft the constitution , taking ownership of the work done by the first CA. This was understood to be a sincere commitment by the political parties then. Looking back, it looks like more of a ploy to attract voters. Political parties perhaps set a one-year deadline considering the hassle they had to go through to extend the deadline and the tussle with the Supreme Court. And if they fail to come up with a constitution by January 22, they plan to perhaps use Article 64 to extend their term. Nonetheless, the major political parties have lost the moral ground to extend the CA’s term, whether it be in the name of ‘consensus’ or something else. Writing a constitution through consensus is anyways an illusion. Nowhere in the world has a constitution been drafted with full consensus. It has been drafted either by political compromise or through a majority. Drafting a constitution , no doubt, depends upon a country’s social and economic development. Even Nepal has its own history of various political changes. But isn’t seven years since the election of the first CA not sufficient to draft a constitution ? So it is time to go beyond the notion of consensus, if the constitution is to ever be drafted. This does not imply that an alternative to consensus is to ignore core democratic values and historic achievements. If consensus cannot be reached among the political parties, what next? American Professor Ozan O Varol, in his article ‘Temporary Constitutions’ published in the California Law Review, attempts to provide an alternate way to build consensus. 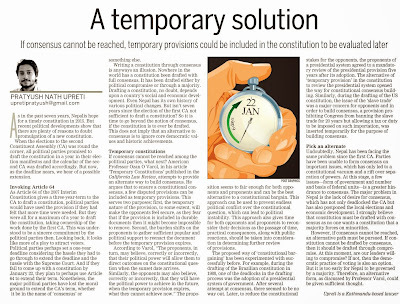 He argues that to ensure a constitution al consensus, a few disputed provisions can be included as temporary provisions. This serves two purposes; first, the temporary nature of the provision, to some extent, will make the opponents feel secure, as they fear that if the provision is included in durable documents then it might become impossible to remove. Second, the burden shifts on the proponents to gather sufficient popular and political support to reenact the document before the temporary provision expires. According to Varol, “The proponents, in turn, may believe, correctly or incorrectly, that their political power will allow them to direct outcomes on the constitution al question when the sunset date arrives. Similarly, the opponents may also believe, correctly or incorrectly, that they will have the political power to achieve in the future, when the temporary provision expires, what they cannot achieve now.” The proposition seems to fair enough for both opponents and proponents and can be the best alternative to a constitution al bargain. This approach can be used to prevent endless political conflict over the constitution al question, which can lead to political instability. This approach also gives time for both opponents and proponents to reconsider their decisions as the passage of time, practical consequences, along with public reactions, should be taken into consideration in determining further review of provisions. The proposed way of ‘ constitution al bargaining’ has been experimented with successfully before. For example, during the drafting of the Brazilian constitution in 1988, one of the deadlocks in the drafting process was the adoption of a presidential system of government. After several attempt at consensus, there seemed to be no way out. Later, to reduce the constitution al stakes for the opponents, the proponents of a presidential system agreed to a mandatory review of the presidential provision five years after its adoption. The alternative of ‘temporary provision’ in the constitution to review the presidential system opened the way for constitution al consensus building. Similarly, during the drafting of the US constitution , the issue of the ‘slave trade’ was a major concern for opponents and in order to build consensus, a provision prohibiting Congress from banning the slave trade for 20 years but allowing a tax or duty to be imposed on such importation, was inserted temporarily for the purpose of building consensus. Undoubtedly, Nepal has been facing the same problem since the first CA. Parties have been unable to form consensus on important issues, which has only led to a constitution al vacuum and a rift over separation of powers. At this stage, a few issues—form of government and number and basis of federal units—is a greater hindrance to consensus. The major problem in Nepal is the lack of desire for consensus, which has not only deadlocked the CA but has also postponed the local elections and economic development. I strongly believe that constitution must be drafted with consensus as no one wants a constitution that a majority forces on minorities. However, if consensus cannot be reached, an alternative path must be pursued. If constitution cannot be drafted by consensus, then it should be drafted through compromise. At this moment, are our leaders willing to compromise? If not, then the democratic practice of voting is also an option. But it is too early for Nepal to be governed by a majority. Therefore, an alternative form, as discussed by Professor Varol, could be given sufficient thought.